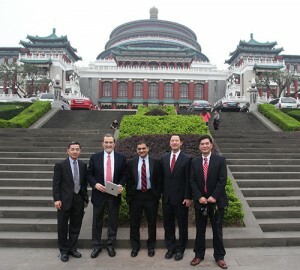 UC Delegation visiting Chongqing University in 2013. In October 2013, the University of Cincinnati’s College of Engineering and Applied Science (CEAS) finalized an agreement with Chongqing University (CQU), a national university in southwest China, to develop a partnership between the two universities and to bring UC’s highly successful co-op model to China. Because of his background and expertise in global partnerships, and his established connections in Chongqing, Xuemao Wang, dean and university librarian, has been extremely involved in establishing this partnership. With his additional role as special advisor to the President and the Provost on China Initiatives, and as a member of UC’s International Working Group and of the Advisory Committee for the China Strategy Group with UC International, Dean Wang has proven to be a valuable resource in the universities’ global engagement strategy. We caught up with Dean Wang recently to discuss his global vision for UC Libraries, his experience with global engagement and his role in helping to usher UC to the global stage. The first is the people.This includes their global awareness, knowledge and appreciation of global diverse cultures and languages, as well as exchanges and partnership experiences beyond our country’s borders. The second is the library’s infrastructure. Today’s technologies have made global engagement much more feasible and easier in ways we couldn’t have imagined 20 years ago.You now can access globally distributed library resources anywhere, anytime and in any format at your fingertips. The third is the Libraries’ materials, resources and collections. As a research library we need to collect, preserve and make accessible research materials on a global scope, whether they are analog or digital, historic or new. The fourth is the about the global impact. A truly globally engaged library not only has its programs and services closely aligned with the institution’s global academic endeavors, but it also takes a leadership role in the global affairs of its respective professional areas. How does the Libraries’ global vision coincide with the university’s? Under the leadership of President Santa Ono, UC is making huge strides in becoming a global university. We have launched academic programs in East Asia Countries and other regions – particularly in China, Africa, the Mideast, Europe and other parts of the world. When our faculty, students and researchers reach out to the world, library access and support must follow. We are now actively planning proactive library services for our global users. We will create a dedicated global services librarian position, and we are working together with the UC Foundation and UC Alumni Association to create a Global Alumni Library Service Portal to reach out to UC’s more than 270,000 global alumni. Before coming to UC you served as the associate vice provost of University Libraries at Emory University and head of Library Systems for Johns Hopkins University Libraries, and helped both university libraries establish partnerships with Chinese academic libraries. Today, you are involved in UC Libraries’ global engagement, while also serving as special advisor to the Provost and President in the China Initiative. How do the relationships among those universities differ? How are they similar? I assisted Johns Hopkins Libraries in strengthening their China Nanjing University Campus library and introduced them to the broader Chinese academic library community. At Emory, we were able to sign a Memo Of Understanding (MOU) with Chongqing University of China and also launched a staff exchange with the Chinese Academy of Science Library in Beijing. At UC, I have even stronger support from the President and the Provost on our global initiatives. We have not only signed a MOU and launched a staff exchange with our partnership university in China, but we are also broadening our global engagement with the rest of the world. Another difference of UC’s global approach is that my senior administrative role as special advisor to the President and Provost on global affairs coupled with my position as dean and university librarian has provided me the privilege and opportunity to help further the university’s global academic initiatives and to integrate the library and the librarian’s role in those initiatives. For example, the head of our CEAS college library, Ted Baldwin, visited Chongqing University Library and participated in the President-led new UC/CQU joint co-op student inaugural convocation in 2013. The following year, Leslie Schick, associate dean and director of the Donald C. Harrison Health Sciences Library, participated in the Provost-led second cohort UC/CQU joint co-op student convocation. This summer, I plan to visit the University of Botswana (UB) in Africa, which has requested UC’s assistance to build a 21st century medical library. I also plan to visit the Future University of Egypt (FUC), whose Provost has invited me to discuss library collaborations. What is your history with Chongqing? Chongqing is my hometown! I was raised there and worked for an academic library there for almost 10 years.Today, Chongqing is one of four municipalities besides Beijing, Shanghai and Tianjin that directly report to the central government. Chongqing is the largest city in southwest China.The city’s population today is 32 million and it has 20+ higher education institutions and a full range of industries. UC is currently engaged with two universities in Chongqing; Chongqing University, which is a comprehensive research university, and Chongqing Medical University, one of the specialized medical universities in the country. 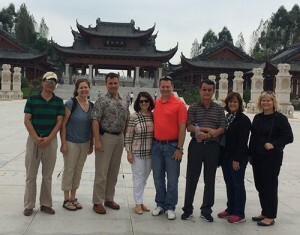 UC Delegation visiting Chongqing University and Chongqing Medical University in 2014. Last October, you accompanied Provost Beverly Davenport to Chongqing University (CQU), and Chongqing Medical University (CQMU). What can you tell us about the trip? Many of UC’s senior administrators have gone on visits to both CQU and CQMU. President Ono led a UC delegation in 2013 joined by deans and other senior administrators. Last year, Provost Davenport led a delegation, again joined by deans, other senior administrators and UC student TAs to Chongqing. Provost Davenport and UC Board of Trustee vice chair Robert E. Richardson, Jr. led all freshman students to practice UC Bearcats sport ritual of “Down the Drive.” Leslie Schick and I were part of the UC delegation. In addition to participating in the Provost-led UC/CQU joint co-op student convocation, Leslie also gave a library information literacy workshop to the freshmen class at CQU. Leslie and I visited and gave a presentation at the Chongqing Medical University Libraries (CQMU). With the success of our partnership with CQU, we are working hard to advance our partnership with CQMU and our academic medical center colleges. We are also looking for a Health Sciences Library and health informatics collaborative opportunities between UC and CQMU. What other opportunities for global engagement do you foresee for UC Libraries both in the near and far term? As I mentioned above, we will reach out to broader global partnership. In addition to the potential opportunities in China and Africa I mentioned above, this summer I will also travel to Australia for an invited panel talk on Global Digital Humanities conference known as DH2015. I hope to visit some Australian/New Zealand academic libraries to seek new partnership opportunities.Through these activities and more planned for the future, UC Libraries is making great strides towards our vision to become the “globally engaged intellectual commons of the universities.” I’d be happy to keep “Source” readers updated as we make the progress in pursuit of UC Libraries global vision.